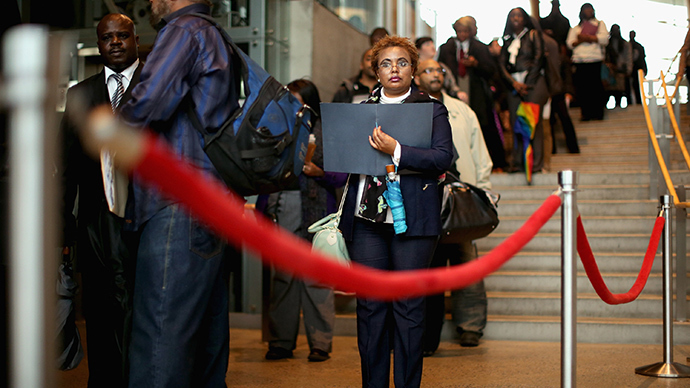 The number of Americans seeking unemployment benefits fell again, signaling that the economy is expected to strengthen and companies will need to hold onto recent holiday hires. Approximately 294,000 people filed for jobless benefits during the week ending January 3, a drop of 4,000, the Labor Department announced on Thursday. Sixteen of the last 17 weeks have seen jobless claims below 300,000, a level which generally indicates a healthy economy that will continue to grow. For comparison, jobless claims were at 333,000 at the same time last year. The current numbers are actually a little higher than what many economists expected – projections somewhere around 290,000. Some economists believe the number will keep falling over the coming weeks, although it’s unclear just how low they can go. "Claims have never dropped below the 280,000-290,000 range in the last 20 years, reflecting the reality that a certain number of layoffs is a natural part of the growth/lifecycle of companies even in the best of times," Anthony Karydakis, chief economic strategist at Millar Tabak in New York, said to Reuters. The numbers come as new data shows that 2014 featured the fewest layoffs since 1997. According to statistics from the global consultancy firm Challenger, Gray & Christmas, American employers cut 483,171 jobs – down five percent compared to the previous year. The federal government is scheduled to release its latest jobs report on Friday, and is expected to report that US payrolls grew by 240,000 and that the unemployment rate dropped to 5.7 percent – the lowest since June 2008. One sector of the economy that could face some turbulence in the near future, however, is the energy industry. According to Bloomberg, falling oil prices could mean that more layoffs are coming, and oil company Halliburton announced in December that it will shed 1,000 jobs around the world. Regardless, with analysts optimistic about the economy, the Federal Reserve could feel more confident about raising interest rates sooner rather than later. The rate has been close to zero ever since the financial collapse in 2008, but earlier this week Federal Reserve Chairwoman Janet Yellen said a hike could be coming as early as April.